The Upshot team at The New York Times has taken a look at the electoral map for a general election match-up between Hillary Clinton and Donald Trump. They see a challenging landscape for the presumptive Republican nominee if he cannot improve his standing in the polls between now and November. Use the link above to read the article. For those that want to play around with the scenarios in it, we've created interactive versions of the maps. Click or tap any one of them to get started. Scenario 1: Based on current polling, Clinton wins 347-191. This is the actual 2012 electoral map with North Carolina flipping to the Democrats. Scenario 2: Trump improves by 5% in each state's polling; Clinton narrowly wins 285-253. 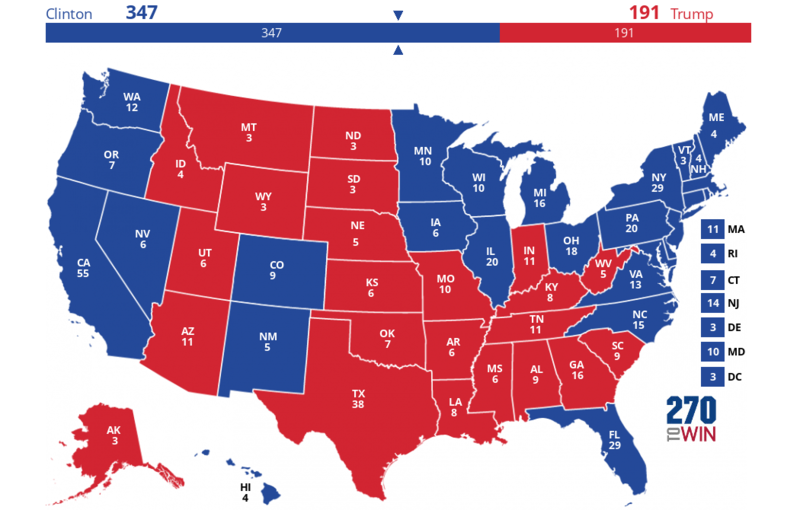 This is the 2012 map with Ohio and Florida moving from blue to red. Scenario 3: Trump improves by 10% in each state's polling; Trump wins 305-233 by earning an additional 52 electoral votes in Pennsylvania, Virginia, Colorado, Iowa and New Hampshire. This analysis assumes that shifts across states would move in tandem. It's a reasonable way to look at things at this point. However, given that Trump's philosophy diverges from other recent Republican nominees, it is possible that his campaign may need to focus its efforts in such a way that a winning electoral map would end up somewhat differently than the above. Embed or share your own electoral map: We've made it easier to share electoral forecasts via social media or to embed a map, like the above, on any web page. Just click or tap 'Share Map', and utlize the buttons that become active below the map. One of those is an Embed button that will let you copy a few lines of HTML to place the map on your page.